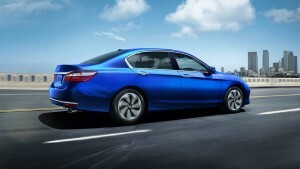 The performance and technology features of the new 2016 Honda Accord are well-known. Yet in addition to offering a dynamic and powerful engine and a range of cutting-edge technology features, the 2016 Honda Accord also gives you an assemblage of safety systems designed to keep you and everyone else on the road as safe and sound as possible, on your next long drive upstate as well as those shorter drivers around town. With Vehicle Stability Assist with Traction Control, a Multi-Angle Rearview Camera with Dynamic Guidelines, Forward Collision Warning, Lane Departure Warning, Collision Mitigating Braking, and Brake Assist, the 2016 Honda Accord is designed to make safety paramount. Next time you’re driving at high speeds down the highway, depend on the Vehicle Stability Assist system available in the Accord to keep your vehicle stabilized and its traction optimal. At the same time, you’ll also be able to maneuver at much lower speeds with the Multi-Angle Rearview Camera, which simplifies parallel parking by giving you a view of the area behind your Accord and allowing you to avoid other parked cars. 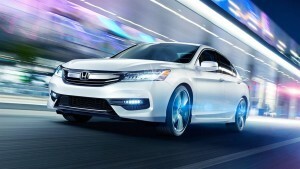 Designed to forestall collisions before they happen, the Forward Collision Warning System enables the Accord to survey the area in front of you and identify threats from other vehicles, alerting you to crises before they materialize. With Lane Departure Warning, the Accord will indicate to you when you’ve begun to drift on the highway, enabling you to correct the drift before you endanger yourself or others. Finally, the sophisticated braking systems available in the Accord serve to reinforce your braking practice, helping you avoid serious mishaps out on the open road. Wisconsin-area drivers are welcome to test drive the new 2016 Honda Accord anytime at David Hobbs Honda. Just stop by our dealership at 6100 North Green Bay Ave in Glendale, or give us a call at 888-216-8497. We can’t wait to show you the ropes in this exciting new car!